These are images of some of the fabrics I shiboried yesterday, photographed this morning. Many of the pieces were over-shiboried today, and I'll post them tomorrow. This batch was dyed teal, over underpainted fabrics. The batch today was dyed bronze ~ actually a green brown. 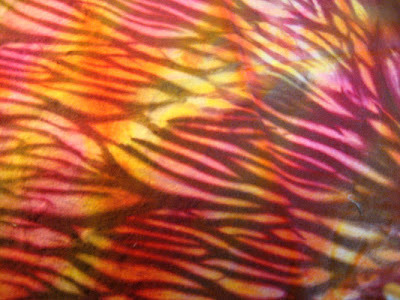 The second dye warmed the fabrics up quite a bit. I wasn't real happy with the overall coolness of yesterday's color, mostly on samples that I didn't photograph. I'm refining my process as I do each batch of shibori, and getting more comfortable with it all. So I'll be doing lots more! I decided this week that every month for the rest of this year, one of my weekly quilts will be an homage to the month. So here's 17/52.2009 ~ April. Purple and green together always remind me of early spring. The garden is just getting going, flowers and trees just beginning to bud and/or leaf out. But there's still coolness and mutability in the air, spring is tentative yet, hasn't quite taken hold. What fun I had in the studio today! 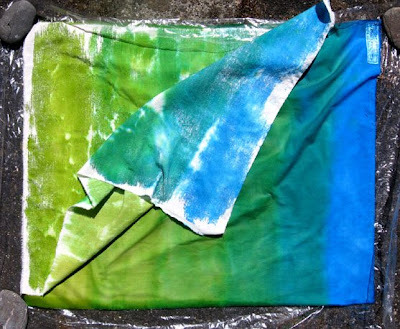 I also did a shibori dye bath, and will post photos tomorrow. I'm just getting my day started, and it's beautiful out there this morning. Here's a recent collage for you to enjoy. I just completed the sixth quilt in my Discharge Series. Finished size is 23.5 inches by 12.5 inches. Now that I'm back into this series, I'm hoping it isn't another four months until I complete the next one! All of my Discharge Series quilts are available for sale, and all are now listed on my website, at this page. 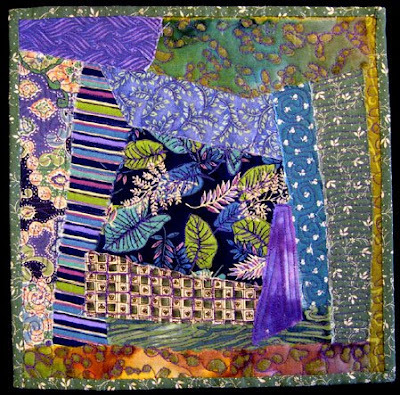 Additionally all of my 2009 Weekly Series quilts are listed on my website, all in one place, here. Many thanks to the numerous readers of my last post for your comments and concern about how tired I'd been feeling. As it turned out, I came down with a little bit of a cold on Sunday evening, which would explain that tiredness. But it seems to be moving through me quickly, so it's really nothing to write home about. And I hope it stays that way! Everything seems different, yet everything seems the same. I'm sitting in my office early Saturday afternoon, trying to feel how this time and place is any different from how it was, say, three months ago. And how I feel is pretty much the same. Although everything on the outside is different. I'm limping along, as it were, toward my growing comfort in/with my new life. Often, it seems, my attitude can change one way or the other in a mere second. In fits and starts I am getting back into the artmaking groove. At some level, though, I still feel really unorganized. I think it's that I'm still trying to get some sense of a Vision for my art and my life. I do know it's about bringing beauty into the world, in a general sense, and in pretty much everything I do. But that is such an amorphous context to be operating within, in terms of a direction, that it is difficult for me to grasp. I've been finding myself really tired a lot, and sleeping as much as I can and whenever I can. That still doesn't amount to more than 7 or 8 hours at night, and often a nap in the afternoon. But it's this deep tiredness that I can't shake. 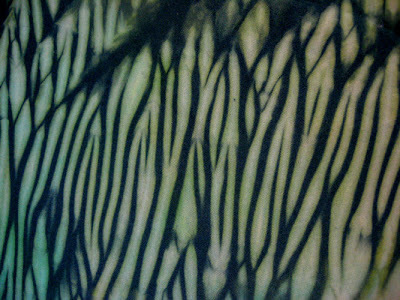 I couldn't wait to quilt some of this new shibori...so here's this week's quilt, 16/52.2009 ~ Mud Slide. I'm really starting to get into a studio groove. I've got another discharge quilt on the design wall and will wrap it up this week. Hot News Flash: I just learned that both of my entered small quilts have been accepted into the Small Art Quilt Open at the Studio Channel Islands Art Center in Camarillo, CA! I'm so glad I called them...the acceptance letter was sent to my old address by mistake and I haven't received it yet. Wow! And apparently I am one of the few who had both entries accepted. That really makes my day! So here are the first at-home, in-my-new-studio shiboris, since taking Jan Myers-Newbury's class in Eugene. As always, I experimented with a number of different things during the process. The first is that I used a bit of kona cotton, which you'll see in the second photo, rather than the unbleached muslin I purchased for the class and now have a ton of to use. 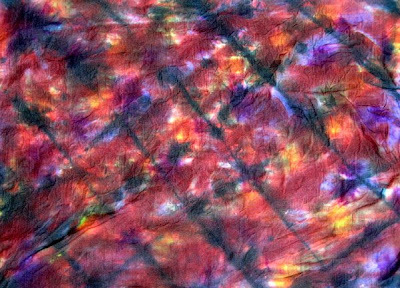 Photos one and three show muslin fabric. The kona does give a bit more of a distinct dye line, but I still favor the hand of the muslin after all is said and done. 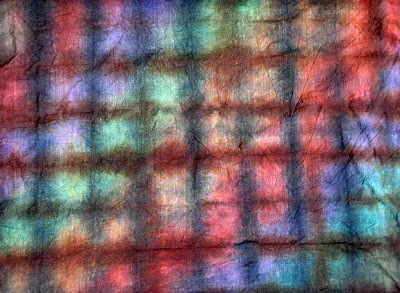 I think I'm going to try bleached muslin sometime soon. And I probably will buy more kona, as well. As I mentioned in yesterday's post, the underpaint on these pieces really washed out, I believe because the underpainted fabric was dried in the sun. Won't do that next time. The piece in the first image was pole wrapped on the diagonal. The second one was wrapped straight on the pole. The third piece was scrunched into a ball and wrapped in a piece of nylon mesh. 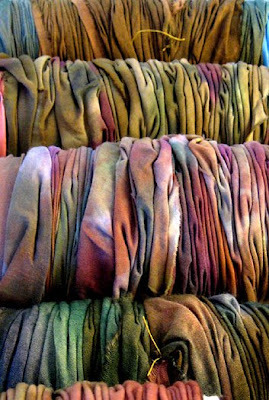 This is something we did in the class with all the dyebaths, and which I intend to do as well with all my dyebaths so I build up a stock of cool handdyed fabrics. Another experiment was with dye color. We used about a dozen mixed colors in the class, and my first thought was to attempt to replicate one of those, using different reactive dyes (I'm currently using Sabracron F's as opposed to Procion MX's) and mixing some of the sub colors as well (a couple of the colors we used in the class included rust dye, so I mixed a rust out of the primaries I currently used). 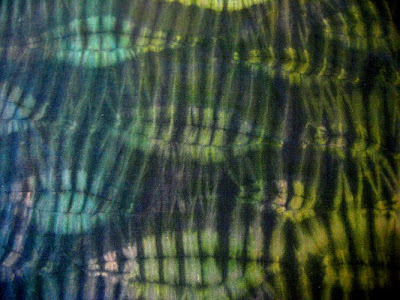 After this first go round, I decided I would simply choose my shibori palette from colors I already use and love. 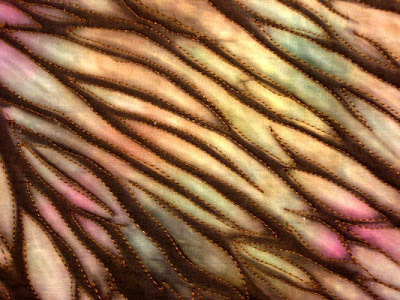 What's more, I'll be using color formulas that I've used with acid dyes for years, only replicating those with reactive dyes with slightly different primaries. So the colors won't be exactly the same, but they'll be just as good in their own right. 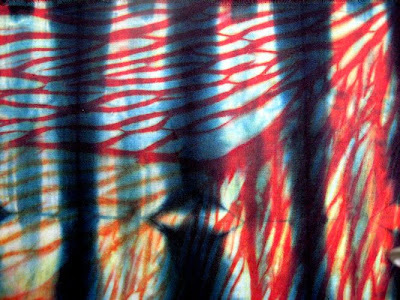 Incidentally, Jan Myers-Newbury doesn't have a web or blog presence, so if you're not already familiar with her work, you'll have to Google her. I felt so honored to be able to work with her as her shibori and her quilts are superlative! 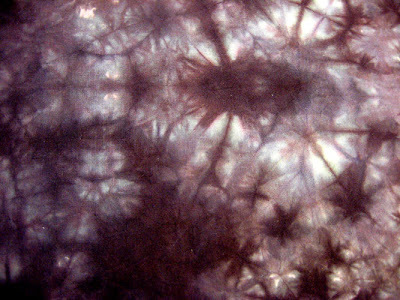 I took these shots early yesterday morning, before the shibori dye later in the day. I love the photos in themselves. 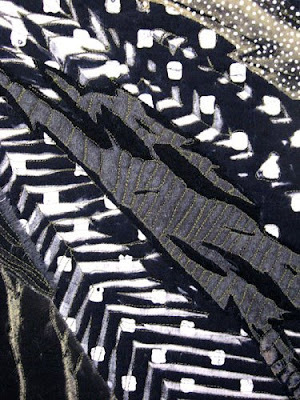 Later today or tomorrow I'll post the shiboried fabrics. Unfortunately, the underpaint washed out a lot, because I "cheated" by drying the painted fabrics in the sun. 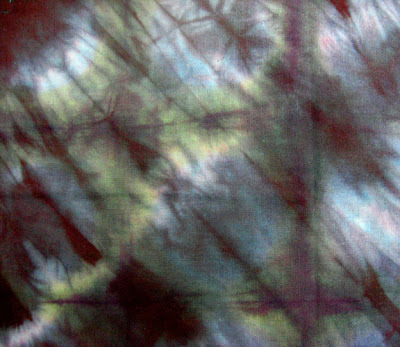 The unfixed dye really washed out and lightened up in the shibori dye bath. But they look great here on the poles. No matter, I've got lots more fabric to work on, and a never-ending stream of more. I'm glad that I did the entire process once through, this week, because of course my working methods have changed with the new studio. And I wasn't quite sure how it all was going to work -- which is why I dried the painted fabrics in the sun, as I don't have a lot of floor space to lay them about. Next time I'll just paint fewer pieces of fabric in one session, to begin with. But once I got started, I just couldn't stop! 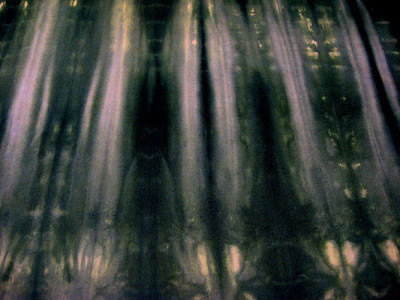 I underpainted some fabrics today that I will shibori in the next few days or week. The underpainting is a kick in itself. 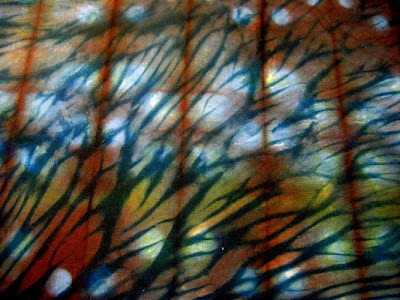 The first three pieces were painted, dried and overpainted once or twice more, until I liked what I got. 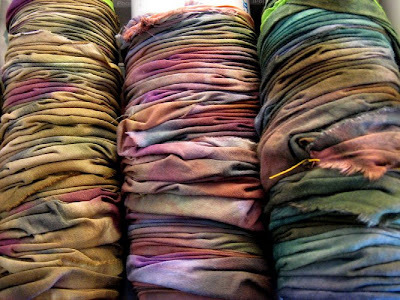 Sometimes something really ugly completely transforms with another layer of dye. The next two images show painted fabrics that I laid a white piece of fabric on top of, then let the top sheet absorb some of the dye from below. This process generates some of the more interesting pieces of fabric, better than the originals IMO. I actually did about 18 pieces today, plus I want to over-shibori a few of the pieces from the workshop I took in Eugene a couple weeks ago. I can't wait to do the next layer on these! I think this piece might catch me up for the year, since I actually started my weekly quilt practice before the first complete week in January. 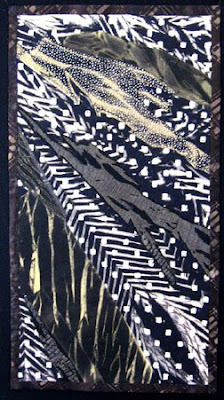 This one is 15.52/2009 ~ Resisted Temptation, made from an early handprinted cotton that I batiked on months later. I've got to run over to the studio to pick up a couple of projects to work on at home today -- I'm spending more quality time with BeeGee in the house, for a while at least, until he feels more comfortable here. Yesterday's 16-hour AWOL on his part freaked me out. I'd been chomping at the bit to get working again, and now I have! Here's weekly quilt 14/52.2009 ~ Wild Thing. 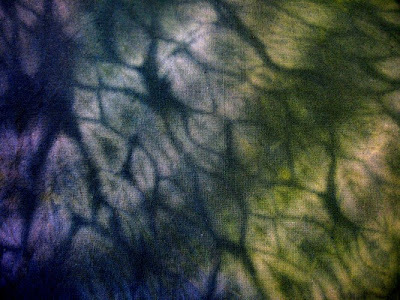 It's a piece of heavyish jacquard cotton I've had for years, that I dye painted a few months ago. I always thought it would make a cool little quilt. And because I missed a couple of weekly quilts, I'll be finishing another one tomorrow. I'm a little bit unsure what my next creative move is, but I figured if I just got working, the next step would reveal itself. I do want to focus in on one or two areas, possibly get back to some ideas I had earlier in the year for directions with studio quilts. I feel like I'm kind of all over the map at this point. I've begun settling into a new daily routine and that's feeling satisfying. My biggest niggle of late is that I inadvertently moved a couple of crucial computer folders onto my thumb drive -- instead of copying them there -- and then deleted them from the thumb drive to make room for something else, all the while thinking the originals were still on my hard drive. Yikes! I guess this is just another facet of getting rid of a lot of stuff I no longer needed! I have been recreating the most important information, but in reality I didn't need most of it any longer anyway. Thank Goodness! 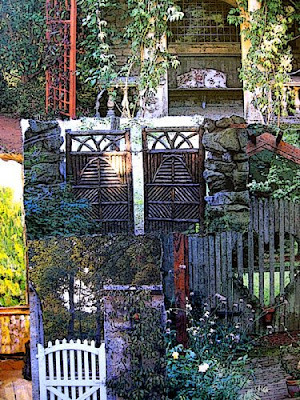 I'm back to my daily collage practice again -- but this collage is one of the last I did before my brief hiatus. 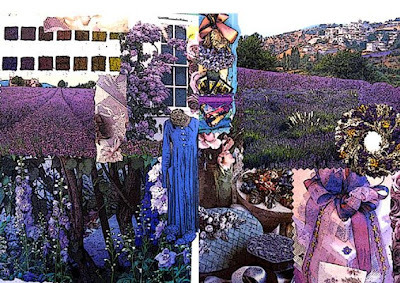 Entitled Homage to Lavender, the intense purple color of those fields of lavender brings the heady fragrance of lavender flowers to my senses. 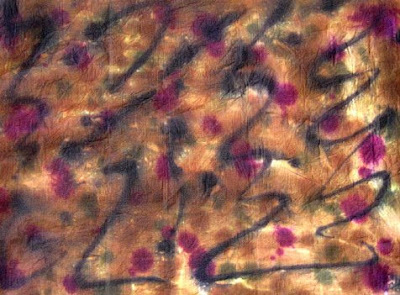 This wonder is called synesthesia, defined by Wikipedia as a neurologically based phenomenon in which stimulation of one sensory or cognitive pathway leads to automatic, involuntary experiences in a second sensory or cognitive pathway. I used to grow lavender, back in my flower-farm days, back when there were just a few varieties. These days there are countless hybrids and cultivars. I saw a lavender plant the other day that had flower heads that were nine or ten inches long! Wow! I think, though, that the best smelling variety is still Grosso. And that's mostly what I grew. And I do hope to someday get the chance to be standing smack dab in the middle of one of those fields of lavender in Provence or Tuscany...and hopefully not just in my dreams! 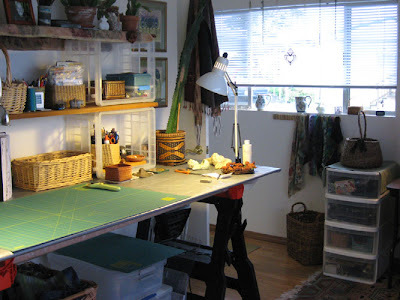 I finished organizing and arranging the studio today, and even did a collage before I went home for supper. This is part of the scene when you walk in the front door. It's my little living/relaxing area, and I can spend the night here when I want to. The only books in the bookshelves here are art books -- everything else is at home. This is the view from the microwave cart in the first photo, looking back toward the front door. 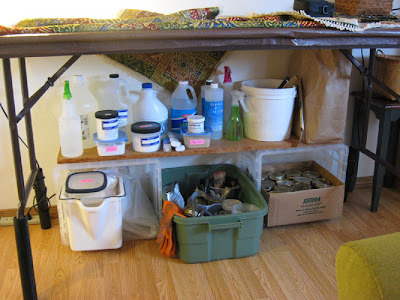 What you're looking at are shelves I put in under the six foot dyeing/wet work table. Here you're walking from the kitchen/living area into the main studio room. I have my sewing machine set up by another door, which I will not be using. You'll see another view of the sewing area in a moment. Finished art cloth is hanging over a rod on the door going into the studio. Here's my 7 foot by 3 foot studio table, with shelves at the back and along the adjacent wall. At left is the north facing window wall in the main studio. Big table is to the right of the photo. This view looks into the closet area. 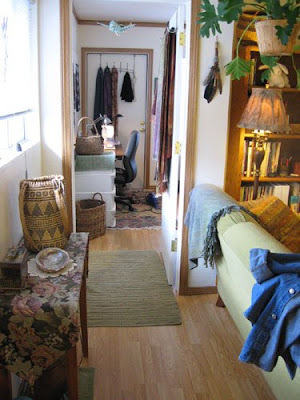 There are built-in shelves on the left before you get to the closet, plus a little alcove in front of the closet. The bathroom is to the right of the closet. Although I didn't take photos of the bathroom, it's rather neat in its own right, and I've got a couple of narrow shelving units in there, plus favorite paintings on the walls. 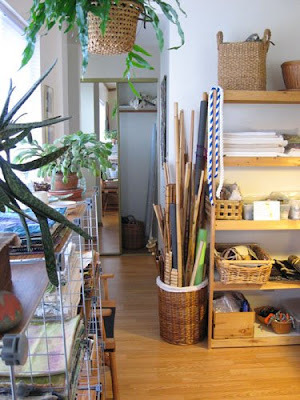 This view is looking back into the studio from the closet. 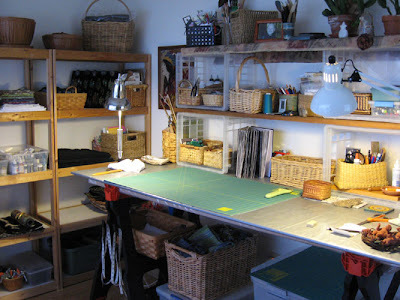 Here's a better look at my sewing area, with the design wall right over the machine. 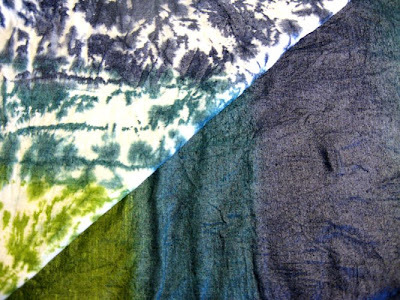 Two of those fabrics you see are from the shibori workshop in Eugene ten days ago or so. And another view of the studio table on the way back into the front room. I'm really happy with the way it turned out. Actually, I saw it just this way in my mind's eye, so it was merely a matter of putting it together one step at a time. It's comfortably roomy, not cramped as I'd feared, and I've got more than adequate storage for my projects. 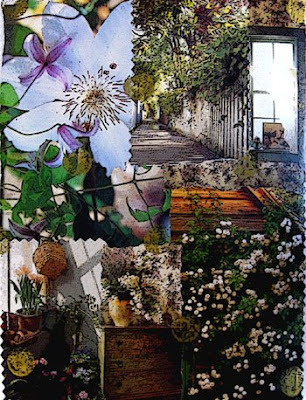 I'm far enough along with my studio redo that I'm planning to make a collage today! In honor of that, here's a piece from last month. 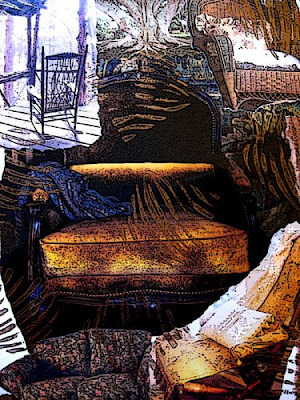 Chairs and couches are another common theme for me ~ places to sit in the lap of luxury, invitations to sit down and relax, opportunities to just take a load off and watch the world go by. Maybe I'll do some of that today, too! Started on the new studio this morning ~ the first photo is the front room/kitchen/living space/wet room-to-be. The next two photos are different shots of the bedroom/main studio. I did some work on this project today but still much to do. I'm feeling exhausted ~ as well I should be ~ so I'm taking it slow. But it is coming together nicely. 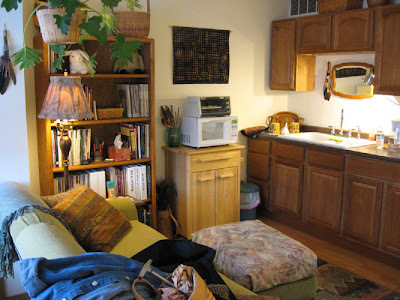 I absolutely love arranging or rearranging space, especially small spaces. Our little home is looking really cozy and wonderful, too. And I'm mighty glad we have a place to put things (aka storage locker) that we don't have room for! 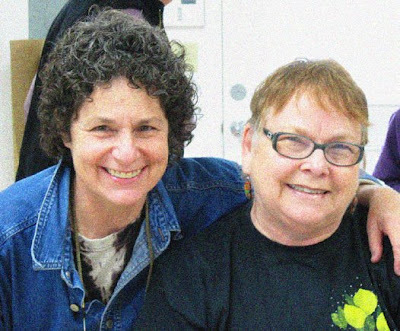 Here's Gerrie Congdon and me, on the morning of the last day of the shibori workshop. Having ourselves a grand ol' time. And both recently shorn! 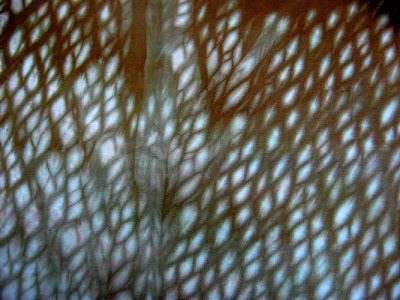 What an incredible shibori workshop that was, exactly what I'd hoped for. 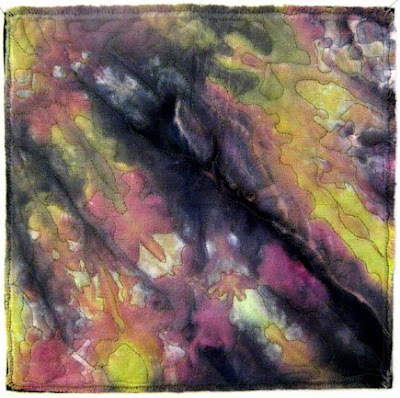 Jan Myers-Newbury is a kick, besides being an awesome dyer and quilter. I feel honored to have been able to work with her. 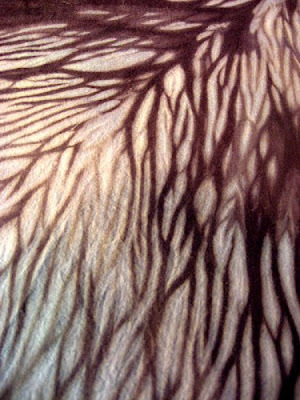 The images that follow are from our last day of dyeing, Tuesday. The first piece was folded and clamp resisted and put in a pot of brilliant orange dye. 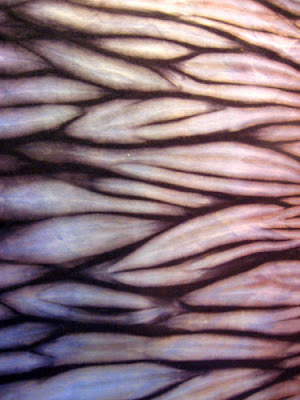 After rinsing, washing and drying, it was pole wrapped and overdyed. The second piece was wrapped around a piece of very thick rope, and dyed. After rinsing, washing and drying, it was rewrapped around the rope again and redyed. 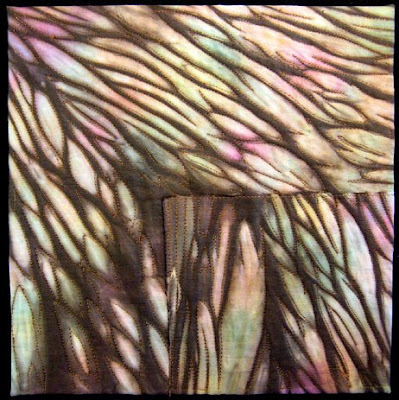 The third piece was clamp resisted and dyed, finished and dried, then folded, tied, and overdyed. 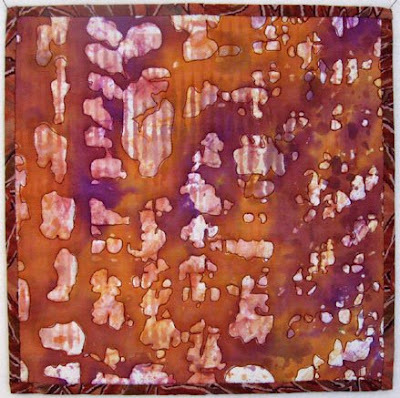 This piece was folded, clamp resisted and dyed, finished and dried, then pole wrapped and overdyed. The last piece was pole wrapped first, then had dye applied to the fabric while on the pole, and after sitting for about 20 minutes, it was overdyed. 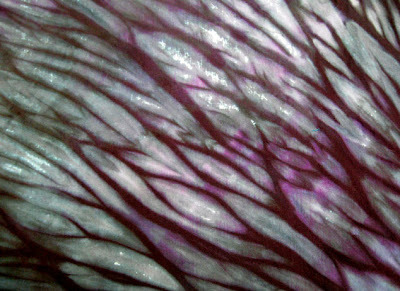 I'm totally stoked that I have a whole new arsenal of shibori techniques to draw upon. 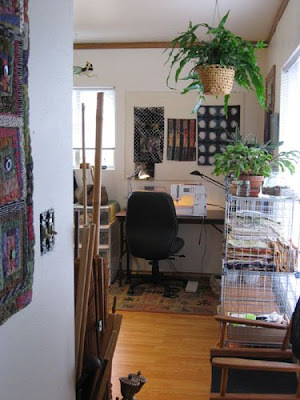 It's about all I want to do right now, and I'm envisioning how it's all going to work in my new studio. Speaking of the new studio, I expect to be fully moved by the end of this weekend. Maybe I'll take a few photos tomorrow, of everything in boxes on the floor of the studio, for my "before" shots. I hope to have things set up within the next week or 10 days, so I can get into making art again!